If you're one of those gamers who were disappointed to find out that BIT.TRIP SAGA wouldn't come with the soundtrack sampler that its Wii counterpart BIT.TRIP COMPLETE is being packaged with, Gamestop has an offer for you. 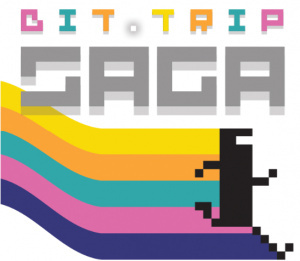 Gamers who preorder BIT.TRIP SAGA through Gamestop's online store will receive a free soundtrack sampler. This is the same soundtrack that will come packaged with BIT.TRIP COMPLETE, only this one comes inside of a really cool CommanderVideo sleeve. It's definitely something to consider for those planning to pick up the game. We'll keep you updated on any new developments regarding these two games as their September 13th North American release date rapidly approaches. Just wanted to say "i hope this comes to Europe too". Having bonuses makes picking up ports / remakes so much easier. What if I just want the soundtrack? A bit absurd that a game known for its music, ported to a system that has a music player and an earphone jack, cannot get the soundtrack out of the box. And don't go telling me it wouldn't fit in the 3DS card. Must...pre-order...NAO!! This soundtrack, like the game, is simply stunning. Is there any word of a PAL release for this and COMPLETE? I'm keen to get my hands on them, but couldn't find any recent information. I think I'm gonna buy both versions even though I already own them all on my wii. This series and cave story are the only Wiiware games I will miss when I get my WiiU and if we can't transfer them I will have another way to play them. I didn't wanna pre-order this, but you give me no other option, Gaijin. Wait, where does it say CV sleeve? Is there a picture of it anywhere? Also, why no pick-up in store? Also, does anyone know a way to get free shipping. I don't even know what Bit Trip really is. I hope we get this in Canada too. I just might consider going for it rather than triple tripping. Great idea, but the day that I actually receive the promised pre-order bonus from Gamestop is the day I instantly drop dead of a heart attack. :/ I never pre-order games, since a while after they're released, I buy them from another store where the games are cheaper. the only bit trip i liked was runner, which i already have, so, i think i'll pass on this one. I'm shocked with all the reserves we do, we can't even offer this to guests in store. BIT.TRIP is an amazing series and the music and gamesplay never cease to amaze me. Definitely getting this. edit: just realized it's US only. Poop. What exactly does it mean by "Sampler"? Like it's giving us 10 seconds of each song? @Oddy (11. ): I guess they don't expect it to sell well. So it's most likely too expensive to have it in store (too). Curses, my plans to save money have been foiled again! @Azikira It has 18 songs, so I'm guessing the 18 main ones that play during each level of each game. No chiptune guest-star stuff though (i.e. no Anamanaguchi, just stuff by Petrified Productions, the BIT.TRIP composers). @LTD Yup that confirms it, GameStop is lame. So I'm actually pre-ordering this, but not from GameStop.